It’s challenging to stay fit and healthy when you can’t participate in most exercises because you can’t skip, hop, or jump. This article will show you how to use a recumbent bike to stay fit with low impact exercise. A recumbent bike is an answer to when you want to get a good cardio exercise, but you are limited because of bad joints, injury, or neck or back issues. I’ve been in that exact position, and I was very frustrated, thinking I would get fat and out of shape. I searched for a way to keep my body healthy during my injury, and the only two options I found were swimming and using a recumbent bike. Since I didn’t own a swimming pool, I decided to try using a recumbent bike, and it worked once I learned how to use it. I want to share that with you. 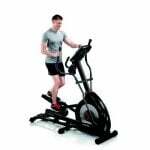 A recumbent exercise bike (of course): There are many recumbent exercise bikes on the market today. Try to find one that has enough tension settings for an intense workout that will raise your heart rate. Make sure that the seat is comfortable, and the back support is reclined enough to take the pressure off your spine. Most models will include some tracking for speed, distance, and time. This comes in handy when you are trying to track your progress. Good comfortable clothing and shoes. Water to hydrate during your workout. Before you even step onto the recumbent bike, you need to make sure your body is ready for the exercise. The best way to ensure you don’t get any injury is to warm up and stretch. The most important places to warm up and stretch are your calves, hamstrings, and quads. Try with a quick 2-minute high step in place to get the blood flowing and the leg muscles warm. Next, make some walking lunges for a minute. As your muscles warm up, you can begin to stretch. Do some toe touches, side bends, and quad stretches. The next thing you want to do is adjust the bike to fit your body. Usually, the seat is adjustable. So are the feet pedal straps. Sit on the seat and adjust to the setting where your knees are slightly bent. This is the ideal seat position for you. Next, put your feet into the straps and adjust the strap to be secure on your toes but not so tight that it will begin to cut off circulation 20 minutes into the workout. Now that your body is warmed up and the recumbent bike is set up to your comfort, you will want to get used to using the recumbent bike and the movements that your body will be doing in the intense workout. Start by doing five minutes of slow biking. Make it as leisurely as possible while still maintaining some speed. This will get those muscles even more ready for the faster paces. As it begins to feel more comfortable, increase your pace until you feel confident in your form. Your shoulders should be relaxed and back. Your back should be up against the reclined back support to take the pressure off your lower spine. Your arms should be down and resting on the armrests. Most recumbent bikes come with programs that help you get a good workout in. You can choose these on the computer, or you can do it manually. If you select a plan already put into the machine, the time and resistance are already determined. All you must do is get on and start pedaling. Below is an image of a computer on a recumbent bike. If you decide to choose your own time and resistance, you need to set those yourself. When deciding on a time, remember that most doctors recommend at least 30 minutes of cardiovascular exercise each day. Any length of time above 30 minutes is excellent. When choosing a resistance level, it is essential to consider your fitness level now. All recumbent bikes have either a knob that turns to adjust the resistance or a button on the computer. Most recumbent bikes have up to 25 resistance levels. You would never want to start anywhere close to the highest strength. Should you ever use the higher resistance levels, it should only be in an interval workout, where most of the exercise is in the lower resistance levels. The reason for this is that the higher resistance levels are great for building leg muscles, but it would be hard to keep your heart rate high enough to benefit from a cardiovascular workout. 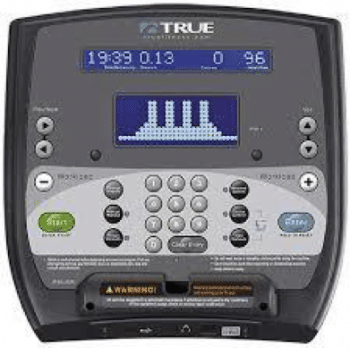 Speaking of interval training, many of the programs would be considered interval training, where the resistance level changes several times during the workout. This is the best way to burn calories and increase your metabolism. Once you’ve set the time and resistance, you’re ready to pedal away! As you continue to pedal, make sure you are away of your form. Assess the difficulty of your exercise. If it doesn’t seem like enough of a challenge, don’t be afraid to change things up mid-workout. Make sure always to challenge yourself for the best results. Try using different tech to make your workout more fun and exciting. There are apps out there that are designed for that very purpose. Try BigRing Virtual Cycling with a VR headset, or a simple tv program like Zwift to simulate real cycling. Have fun with it! What do you think? Are you ready to try a recumbent exercise bike? I hope I taught you how to use a recumbent exercise bike well enough to make you feel confident about getting on one and getting all the benefits you can. Do you know of someone who could use a recumbent exercise bike? Feel free to share this article with them.